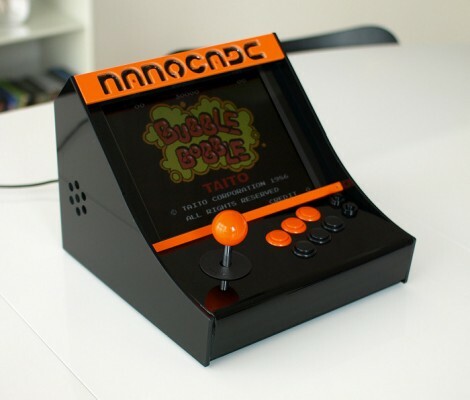 This nice table-top MAME arcade features a two-toned acrylic case. [Fabricio] spent about 50-60 hours designing the 29 parts that make up the enclosure. Originally the sides were meant to be orange but one design flaw meant he had to have them recut and only had enough black stock for the job. But we like it this way. The screen is just over ten inches and inside you’ll find a mini-ITX motherboard with a gig of ram and a solid state drive. The seven page build log features some bending, glue, screwing, and wiring that really show off the depth of the project. This results a very modern look but if you like your retro gaming to appear vintage we recommend this cocktail cabinet. Looks good and I prefer the black sides. Love the build. Nice job! thats a retro look more than a modern one, change the orange to red or blue though and it wouldn’t look out of place in the new tron movie, which is exactly what they were going for back in the day, things that look futuristic. this is so awesome, the attention to detail and everything is really great. it looks like a commercial product. Excellent job. BLACK looks better on the sides IMO. Its a shame that cocktail cabinets are not popular in bars these days. Those buttons are just tactile push buttons, right? Does anyone know how the button input is processed by the computer? What was the cost and what processor is it using intel atom or something else? Slick as hell, nice job! If I were into arcade, I’d absolutely buy a kit. Incredibly nice work! @Mr Earl, regarding the buttons, they appear to be tied back to the joystick. I imagine he simply extended the buttons from it which makes integration much simpler.